This green makeover is part of a $500m (£340m) refit which the building's owners hope will attract bigger companies paying higher rents. 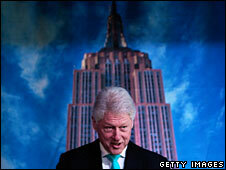 Former President Bill Clinton's Climate Initiative has helped fund the project. Mr Clinton and New York Mayor Michael Bloomberg say the changes should be a model for other buildings around the world to follow. Some 13,000 people use the Empire State Building every day - including the many visitors to the world famous landmark's observatory. The work will include a layer of film added to each of the 102-storey building's 6,500 windows, insulation behind radiators and improved lighting, ventilation and air conditioning. People working in the building will be able to use the internet to monitor how much energy is being used, and where. The plan is to cut the amount of energy used by 38% per year, saving $4.4m.